Home Blog New sound effects: quadcopters, tape machines, seagulls, cetacean percussion – and more! New sound effects: quadcopters, tape machines, seagulls, cetacean percussion – and more! This week on A Sound Effect, we have sounds that will help you express your interesting new worlds. If you’re looking for sci-fi movements, whooshing lightsabers, or futuristic user interface sounds, we have those. If you’re looking for orchestral percussion that sounds like it came from the bottom of the ocean, we have that, too. And if you want close-up sounds of wolves, seagulls, elevators, quadcopters, and tape machines, you’ll be happy with what you hear – and how they’ll inspire you to experiment! 'CyberSphere' by PM:SFX is a collection of intricately designed UI and HUD sounds. From multilayered calculations to simple chirps, this library has a range of effects for your mobile games, futuristic consoles, and more. All together you get over 300 sounds of clicks, beeps, glitches, transmissions, text read-outs, holograms, glitches, and more! If you need an all-around useful user interface library, look no further. 'Wolves & Coyotes' by Audiohero features 150 wolf and coyote sound effects hand-picked from libraries by Sound Ideas, Hollywood Edge, Digieffects. In this collection, you will hear vicious barks, growls, moans, and whines, as well as playful pups and, of course, those iconic howls. These sounds are great for adding both realism to your scene and giving voice to your game's predatory enemies. For a solid collection of these wild canines, give this one a listen. 'Sci-Fi FX' by 3MAZE is an epic compilation of over 200 designed glitches, textures, robots, UFOs, machines, and more. 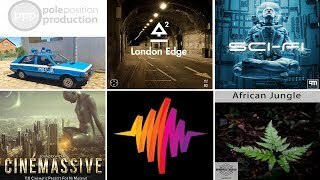 This library will help you quickly layer your scene with sounds of android and spacecraft movements, glitchy ambiences, crucial malfunctions, and dramatic launch sequences. It really covers quite the scope in terms of both scenarios and frequencies! Whether you need sounds for your machines or a little futuristic spice, be sure to check out the demo. Imagine you are deep in the ocean, but replace the surrounding whales and dolphins with echoing gongs, drums, and Tibetan bowls... You might be in a world created by Michal Fojcik! In his new library 'Performed Orchestral Percussion', you will hear lots of concert percussion like timpanis, taiko drums, toms, gongs, vibraphones, rainsticks, chimes, and more that have been experimented with and could influence the entire direction of your sound. If you want something new and unique, this one will inspire you! 'Seagulls' by SonicSalute gets you 28 tracks with birds that signify a large body of water is nearby. This collection has plenty of scenarios - from flocks over the harbor to nesting colonies to isolated shrieks. It also covers their extensive calls with repetitive barks, high-pitched squeals, raspy wails, bullfrog-like bellows, and more. For over a half hour of a bird we simultaneously love and hate, check this one out. 'Light Sabre' by Big Room Sound Inc. is a quick pack of sounds inspired by our favorite space opera. This library was born out of the curiosity of independent filmmaking to offer you lightsabers with their own personality. You will hear swings, clashes, retractions, and more - and though they weren't created by Ben Burtt, another award-winning sound designer had a hand in their creation. For over 60 sounds of these re-imagined weapons, give this one a listen. 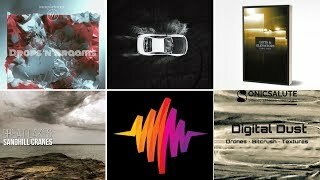 'Curious Drone-Quadcopter' by Kevin Durr is an impressive collection of UAV sounds that captures their wide range of buzzing movements. With over a half hour of recordings, you will hear these fun little (and sometimes not so little) aircraft as they rush around the atmosphere, offering you sounds of buzzing, wobbling engines, zippy passbys, and fantastic crashes. Plus, it features drones by DJI and Hubsan with the metadata to back it up! If you need sounds of quadcopters, look no further. 'Lifts & Elevators' by If a Tree Falls gets you clean, up-close sounds from 19 different elevators. From modern lifts in hotels, universities, and offices to the tried and tested elevators in apartments and warehouses, you will be able to hear low ambient hums, rattling, screechy groans of the gears, and more! Plus, you will get sounds of alarms, chimes, announcements, buttons, and an impressive list of metadata. For a library that'll be your friend for industrial ambiences, indoor transportation, interesting doors, and more, you won't regret this purchase. 'Vintage Tape Machine' by resonant features the sounds of a Nagra 3 open-reel tape recorder from a 1963 model. This interesting display of sounds includes its switches, buttons, and dials, as well as hand winding, opening and closing the lid, and the device playing with and without tapes. Overall, you get a bouquet of analog gems for your retro-futuristic (or just retro) gadgets and gear. For over 150 sounds of 20th-century high tech, check this one out.